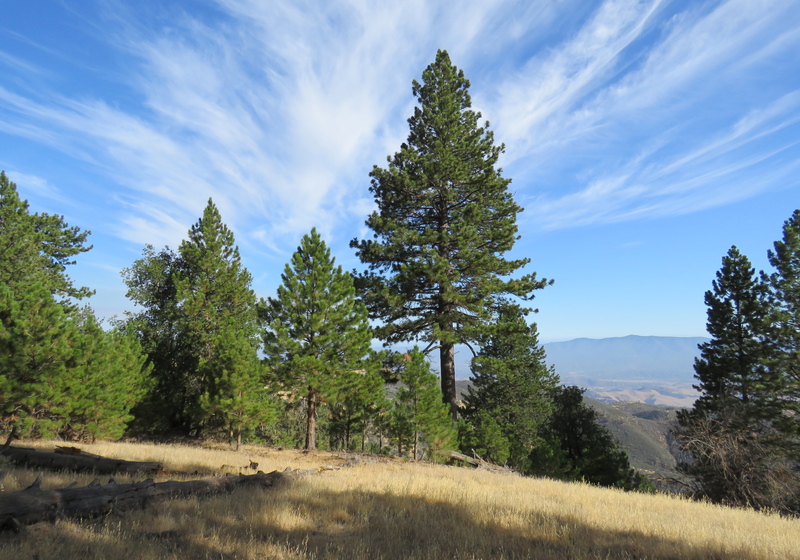 Near the summit of Figueroa Mountain, overlooking the Santa Ynez Valley, is a stand of conifers and oaks that provide an opportunity to appreciate the beauty of our local mountains. Pino Alto Nature Trail is an interpretive trail that describes the ecology of these plants. The half-mile long trail is wheelchair accessible and starts from Pino Alto Picnic Area. To get to the trailhead from Los Olivos, take Figueroa Mountain Road. The road leads through the ranch lands of Alamo Pintado Valley, before climbing towards Figueroa Mountain. The road eventually arrives at the turnoff for Figueroa Lookout Road. The unpaved road is suitable for most vehicles and leads to the top of Figueroa Mountain. It’s roughly 1.5 miles along Figueroa Lookout Road to the signed turnoff for Pino Alto Picnic Area. The picnic area is at about 4,500 feet of elevation and has five sites spread out under the trees. The picnic area and trail were built in 1973 by the Forest Service with the help of volunteers and local organizations. Each site has a picnic table and standing barbecue grill. Three of sites are wheelchair accessible and have paths that tie in with the interpretive trail. The nature trail leads through a mix of predominantly ponderosa pine, big cone Douglas fir, canyon live oak, and sky lupine. And this limited variety of plants actually makes it easier to identify them. This in turn helps one learn some of the key characteristics of each plant, making them easier to recognize elsewhere in the forest, particularly when they’re growing amongst different plants. The tallest, and perhaps easiest of the trees along trail to identify is ponderosa pine. The bark of the mature tree is a rusty orange and brown color that is split into large plates, and on closer examination has smaller, jigsaw-puzzle looking pieces that flake off. Younger trees, those under 150 years old, have darker bark, but the tree’s overall appearance is similar. Ponderosa pines take their name from the latin ponderosa, which means heavy, a reference to the tree’s heavy wood. Elsewhere, where the tree is more widespread, ponderosa pines are harvested for their lumber. In fact, ponderosa pines are third in annual production behind Douglas fir and hem-fir, with Oregon being the largest supplier in the United States. The tree can grow to over 200 feet and live for more than 500 years. Ponderosa pines prefer elevations from 3,000-9,000 feet, and can be found in many of the mountain ranges in the western United States and southern British Columbia, including the Rocky Mountains, Cascades, Sierra Nevada, and our local Coastal Range. Competition amongst the conifers and other plants for sunlight, moisture, soil, and nutrients is one of the factors the defines the composition of the trees and plants along the trail. Because of its height, ponderosa pines under the right conditions are able to thrive, taking more of the available sunlight. The other shorter conifer found along the trail, often found growing right next to ponderosa pines, is big cone Douglas fir, which is more shade tolerant than other trees. The cones of the two trees can be differentiated by how they feel. The cones of ponderosa pines are rougher to the touch when rolled between the hands than those of big cone Douglas fir. Also known as big cone spruce, although not a spruce, big cone Douglas fir are found only in southern California. In fact, its western limit in the San Rafael Mountains is near Zaca Peak. Its northern limit is at Mount Pinos. And its southern limit is in the Peninsular Range in San Diego County, near where it was first identified in 1858. Big cone Douglas fir typically grow to between 60-100 feet in height, and can live for more than 250 years. The tallest recorded big cone Douglas fir is “Old Glory”, found in the San Gabriel Mountains near the trailhead to Mount Baldy. The tree, which was 145-feet tall before it was damaged during a windstorm, is said to be between 600-700 years old. Big cone Douglas fir can be found along cool moist slopes and in canyon bottoms, as well as warm south facing plateaus, in elevations ranging from 900-8,000 feet. The tree can often be found in the transition between lower elevation chaparral and higher elevation mixed conifers, moving as far down into the chaparral as conditions will allow. The tree is also often found growing with canyon live oak, and in some cases can form a somewhat exclusive and stable plant community with the oaks, with the two serving as the codominant plants. Canyon live oak, which is also found along the trail, does well here amongst the conifers, as the seedlings and saplings are both shade tolerant. Canyon live oak can grow to between 20-70 feet in height, and can live as long as 300 years. 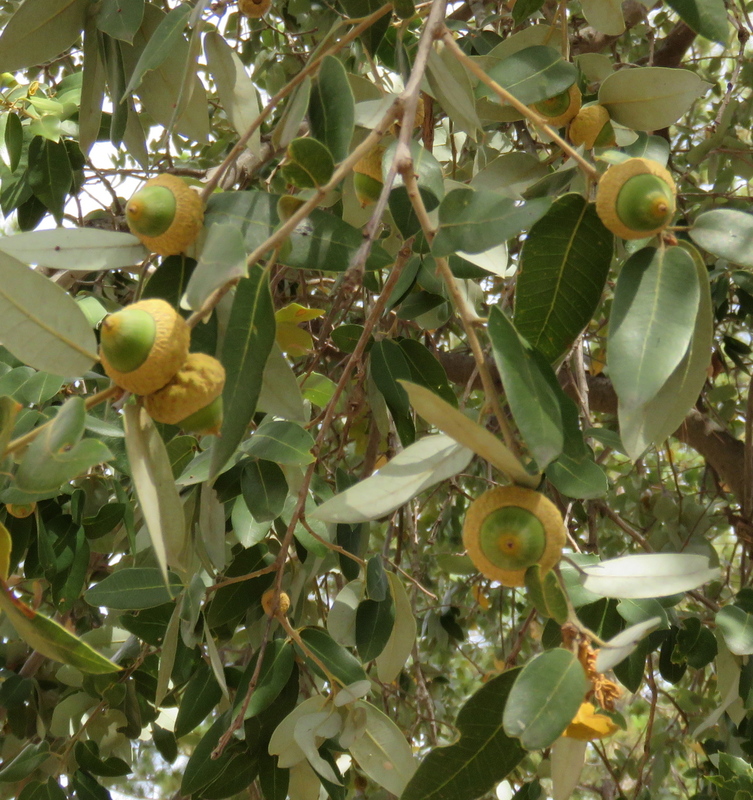 The tree is found throughout much of the southwest, and can be found in elevations ranging from 700-9,000 feet. Canyon live oak goes by several other names. It’s also called maul oak because its hard, dense wood has been used for wood-splitting mauls and other tools, and even wagon wheels and axels. And it’s also called golden cup oak because of the golden layer of wooly down found on the acorn caps. The acorns, like those of other oaks, are used by a wide variety of animals, including acorn woodpecker, band-tailed pigeon, scrub jay, Steller’s jay, dusky footed wood rat, western grey squirrel, deer, and black bear. Standing under the oaks, during the summer, one can sometimes find the temperatures to be noticeably cooler. This effect is caused by transpiration, whereby moisture is transmitted from the roots, through the tree, to the pores on the leaves, and released as water vapor providing a cooling effect. 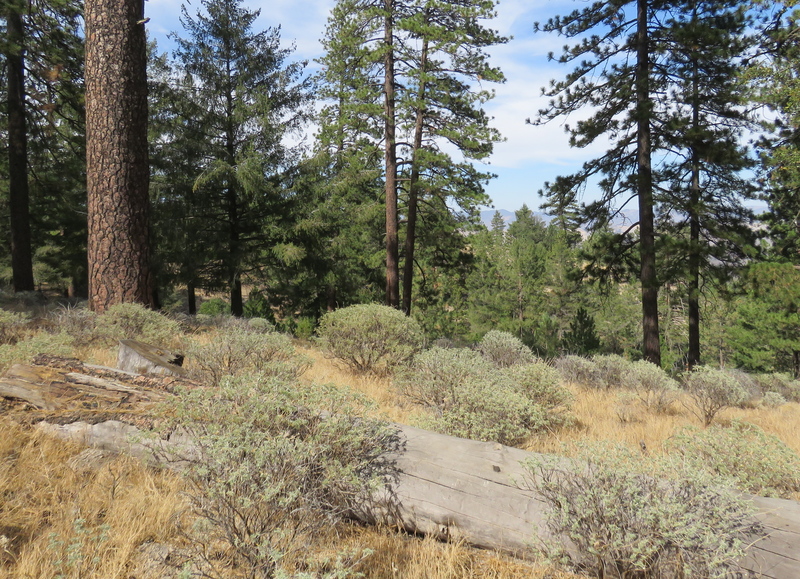 The effect is even more noticeable at Cumbre Picnic Area, where there is a higher ratio of canyon live oak amongst the ponderosa pine and big cone Douglas fir. Roughly midway through the loop, the trail offers views out across the Santa Ynez Valley. On a clear day the view can include Cachuma Lake, the Santa Ynez Mountains, and beyond them, the Channel Islands. Continuing around the loop, the next noticeable plant is sky lupine. This flowering plant, which is in the legume family, appears as a low bush. During the spring, its purple flowers are part of the annual display of spring wildflowers for which Figueroa Mountain is famous. From Pino Alto Picnic Area, one can continue along Figueroa Lookout Road towards the top of Figueroa Mountain. About a quarter-mile past Pino Alto Picnic Area, the road branches, with the road to the right continuing to the lookout site, and the road to the left leading to Cumbre Picnic Area. From the top of Figueroa Mountain, one is treated to exceptional views out across the San Rafael Wilderness, including out towards Hurricane Deck and the Sierra Madres Mountains. At the site is a picnic table. The nearby lookout tower is closed to the public. Cumbre Picnic Area is about a half-mile from Figueroa Lookout Road, along a somewhat rougher unpaved road. The site is under a stand of canyon live oak mixed with big cone Douglas fir and ponderosa pine. There is one picnic site with a picnic table and standing barbecue grill. Figueroa Mountain Campground, which is just a short ways past the turnoff for Figueroa Lookout Road, offers car camping. The campground has 33 campsites, each with a metal fire ring, standing barbecue grill, and picnic table. The campsites are on a first-come first-served basis. An adventure pass is required to camp, as well as use the picnic areas associated with Figueroa Mountain. There is no water at any of the sites. This article originally appeared in section A of the August 10th, 2015 edition of Santa Barbara News-Press.